Earlier this year, I claimed that we are in a long-term multi-year bull market. And I still stand by that, but I think that there is a potential for a small recession starting in the later half of this year. 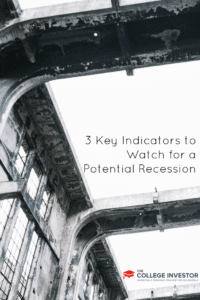 Maybe it will be a correction and simply a blip on the radar — but there are at least three key indicators that you need to pay attention to on the macro-economic level that could indicate tough times are coming ahead. The bottom line is that the economy is still weak. There are multiple headwinds that the economy is facing, and I think a lot of people are underestimating the impact of them compounded onto the economy of a whole. Here are three areas that I’m concerned about right now . . . . The first bucket I’m concerned about is consumer spending. Wal-Mart (WMT) posted terrible earnings, and highlighted their concern around weak consumer spending. I wouldn’t be surprised if Target (TGT) and other retailers post the same thing this earning season. The truth is, consumers still aren’t spending a lot — and when they do spend, they are sticking to essentials. Consumer spending drives the majority of the U.S. economy, and failing to spend money will trickle through to the rest of the economy. And do consumers really have reason to worry? Yes they do! There is still a lot of employment uncertainty — a weak economy means less hiring, then tack on furloughs, and you have a challenging environment for the average Joe. But I don’t blame the consumer, I really blame Congress . . . retail spending is just an indicator. Congress is truly at fault for the weak economy, and their action on three separate issues will be a key indicator of how the economy will fare in the second half of the year. We already know how Congress promotes financial unaccountability, but most members of Congress are truly unaccountable to how their actions impact the economy. The issues before Congress that we need to pay attention to are Obamacare, taxation, and the debt ceiling. Obamacare isn’t a problem for the reasons Republicans portray in the media. No, Obamacare is a problem because Republicans keep trying to repeal it or modify it. The truth is, businesses need a stable set of government regulations to do business in. For the most part, businesses don’t care whether Obamacare exists or doesn’t exist. They just need to know what it will be so that they can plan accordingly. Right now, it is nearly impossible for a business to plan for their healthcare costs (and possibly their tax liabilities) because of the uncertainty around this massive program. As a second thought, this doesn’t even touch on the off-base threats to shut down the government if Obamacare isn’t repealed. Let’s just hope this doesn’t gain any more traction, because that would surely throw the economy into a recession for at least the quarter in which the shutdown takes place. Taxation is another area that has businesses hurting. Wal-Mart, in their last earnings statement, highlighted that the higher payroll taxes that went into effect this year are hurting the consumer. That’s just the tip of the iceberg when it comes to taxation issues facing the economy. The furlough (as a result of a standoff from taxation and tax cuts) has significantly hurt the economy because a lot of people are suddenly getting a lot less to spend each month. While this will alleviate a bit in the fall, there is already talk of more cuts. That doesn’t bode well for the weak economy. Finally, we’re coming up on debt ceiling negotiations again. Hopefully Congress learned their lesson from last year, but chances are they didn’t. It will once again be down to the wire, and there is going to be a lot of unnecessary brinkmanship. What Congress doesn’t get is that all of their brinkmanship has negative impacts on the economy, and failure to move quickly on this can further negatively impact the economy. Finally, the idea of the Fed raising interest rates before the structural issues of the U.S. Government are addressed are scary. The economy is weak on both the unemployment and economic growth front because of the actions of Congress. But too many people are critical of their easy money policies. While sound can be wound down or scaled back, for the most part, the policies need to continue until there is sustained growth in the job market and sustained economic growth — combined with structural reforms that will ensure we can maintain the progress we’ve built on since the Great Recession. 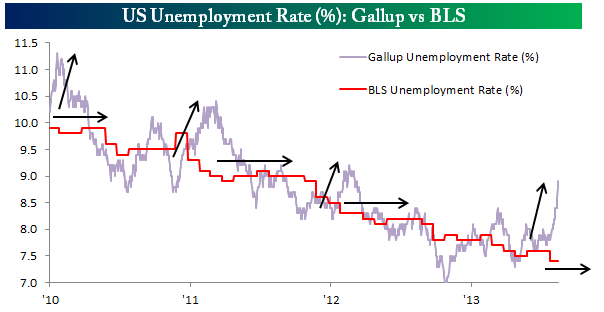 Without structural change, the Fed raising rates will simply be pulling the economy off life support. People may criticize Bernanke and his loose policies, but people tend to forget that Bernanke was a scholar of the Great Depression. His doctoral work was based around how the United States could have responded differently to the Great Depression, and how the legislative actions combined with the actions of the Fed actually made matters worse, not better. Right now, our current situation really parallels that Great Depression. We had a big shock in 2007. Here we are in 2013, and there are still not a lot of solid foundations. The actions of the Fed are the only actions that can be pointed to that have contributed to some stability. The bailouts — championed by Bernanke — were also successful at the time. But the fact is, without further structural changes by Congress, the economy will nosedive without Fed stimulus. Remember, these are indicators. One thing occurring or not occurring doesn’t mean anything. However, I believe that if all of these events occur, or at least a majority of them occur, the economy will tumble back into recession. So, for the macro-economic watchers, what are your thoughts? Are we on the brink of heading back into a recession? I agree with you on most fronts. The one thing that I deviate with you is with regards to ‘there are still not a lot of solid foundations’. I think that many companies have built solid balance sheets and have put practices in place that lead to sustained profitability. This differs greatly from 2007 when many companies had terrible balance sheets and were losing money. Yes, it would be nice to see more growth, but there are quite a number of differences between six years ago and today. I think some companies have more solid balance sheets, but I think many of the financial companies are making it look like they have solid balance sheets, when in reality they aren’t much different from 6 years ago. Hey Robert, another great post here. I really like what you mentioned about Obamacare. It’s important for us to remember that political sides will come up with something and stick to it even if they are telling us about the wrong issues. With things moving around so drastically, how can we expect business owners to hit the mark? Great post as always! The Economic Cycle Research Institute says a U.S. recession began late in 2012. It’s arguing GDP will be revised to reveal the downturn. I have been concerned about the ECRI recession call for a while. Yet, the stock market has continued to rally due to Fed intervention. I feel a downturn is just around the corner and when it comes it could be fairly severe. 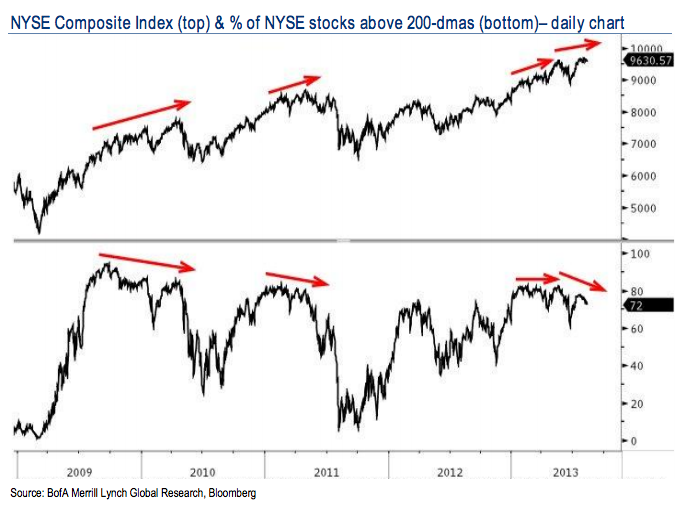 Here are two charts you might be interested in. Although the recovery is jobless, corporations have made record profits. I believe it will continue including less jobs. Corporations have leaned on existing employees for so long and will hold off hiring. This means profit and margins will remain the same. My company which has over 20,000 employees, said Obamacare would not really affect our costs one way or another. I wish the stupid Congress would leave it alone and allow it to run its course. The thing that has affected our company has been the sequestration. That was a dumb way to cut expenses. As far as the debt ceiling, we are already into the red, but the Treasury is keeping us afloat with their “extreme measures.” Once again, Congress is waiting until the last possible minute before they do anything. Why can’t they just increase the ceiling without a peep, as they have so many other times, and just move on? Not a very smart way to run a country.